The ATH-R70x is Audio-Technica's first-ever open-back reference monitor headphone. 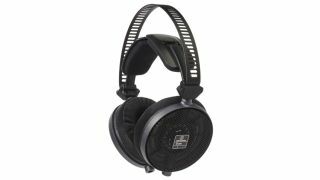 NAMM 2015: Audio-Technica certainly knows how to produce a good pair of headphones, so we're pleased to be able to tell you that the company has three new 'pro' sets in Anaheim. The ATH-R70x (£349) is a first for Audio-Technica, being a pair of open-back reference monitor cans, while the ATH-M70x (£299) sits at the top of the M-Series range. The ATH-M50xDG (£179), meanwhile, is a limited edition dark green version of an existing favourite. All the details are below, or you can check out the Audio-Technica website. Audio-Technica's first-ever open-back reference monitor headphone, the all-new R70x has been created in conjunction with Paris-based design agency Arro. The final result perfectly blends form and function, with aluminium mesh earcup housings contributing to the model's extremely low 210g weight. Combined with generous breathable fabric earpads, the light weight of the R70x makes it outstandingly comfortable during long sessions. In terms of tone the proprietary drivers in the R70x - combined with the headphones' acoustically transparent housings - deliver beautifully natural, spacious open-back tone. The 45mm drivers, created specially for the R70x, represent the culmination of Audio-Technica's more than 40 years of headphone design. In addition distortion is reduced, high-end frequency response extended and accuracy improved with the use of high efficiency magnets and a pure alloy magnetic circuit design. Audio-Technica's much-loved M-Series professional monitor headphone range has long been relied on by producers, engineers, musicians and DJs in the most demanding recording and performance situations. And with the arrival of the M70x, the range has a new high-performance range-topper. Designed specifically to reveal the most detailed nuances in a mix, the M70x is tuned to reproduce extreme low and high frequency content with remarkable accuracy. Its impressive 5-40 000Hz frequency response is perfectly balanced - thanks to proprietary 45mm large-aperture drivers with rare earth magnets - and even at high volumes the M70x's 2000mW maximum power input means very low distortion for superb clarity and definition. The combination of accuracy and power handling makes the M70x the perfect partner for studio and live sound mixing, tracking, DJing and critical mastering and post-production work. A new limited edition version of Audio-Technica's renowned M50x headphone, the M50xDG's stylish dark green finish adds some urban cool to one of the world's best-loved studio models. Part of the re-engineered M-Series, the M50xDG features the original's 45mm large-aperture drivers, sound isolating earcups and very high SPL handling to deliver natural, accurate sound in high pressure professional situations as well as working superbly for general listening. The aesthetically-appealing M50xDG also feels as good as it looks thanks to its comfortable earpad and handband material and 90-degree swivelling earcups for easy one-ear monitoring.